Scale: It is 51 miles from Carnforth to Ormskirk and 49 miles from Blackpool to Colne. 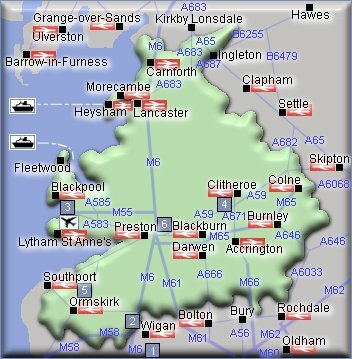 Ferries indicated Fleetwood and Heysham. Rail Stations (Not all stations shown). - Haydock Park Racecourse, Newton-Le-Willows WA12 0HQ. Tel: 01942 402624. haydock-park.co.uk. - Wigan Pier, Wallgate, Wigan, WN3 4EU. Tel: 01942 323666. - Pleasure Beach, Blackpool. Tel: 0870 444 5566. blackpoolpleasurebeach.com. - Whalley Abbey, The Sands, Whalley, Clitheroe BB7 9SS - Tel: 01254 828400. whalleyabbey.co.uk. - Martin Mere Wildfowl & Wetlands Trust, Burscough, Ormskirk. Tel: 01704 89518. Gawthorpe Hall, Padiham, nr Burnley, Lancashire BB12 8UA Tel: 01282 771004 An Elizabethan house with rich interiors and an important textile collection. National trust charges apply. About 7 miles north east of Accrington. The East Lancashire Railway was opened in 1846 to link the Manchester to Bolton line with Radcliffe and was a popular passenger and freight route which served the Irwell Valley from Bury, via Ramsbottom, to Rawtenstall and beyond. 1972 saw the last passengers travel on the Bury to Rawtenstall section, and that would have been the end of an era had the East Lancashire Preservation Society not been committed to restoring the line to its former glory. The line was reopened in 1991. www.east-lancs-rly.co.uk. About 6 miles south of Accrington. Lewis Textile Museum, Exchange Street, Blackburn, BB1 7JN, Lancashire. Tel: 01254 667 130. Opened in 1938. The history of Blackburn's cotton industry. Costume and Textile based exhibitions. A replica of Hargreaves' Spinning Jenny. About 7 miles west of Accrington. Haydock Park Racecourse, Newton-Le-Willows WA12 0HQ. Tel: 01942 402624. Haydock Park is the North West's premier dual purpose racecourse located half way between Liverpool and Manchester, just off junction 23 of the M6 motorway. With around 30 events a year, we offer an excellent choice of top-class fixtures over the jumps and flat. www.haydock-park.co.uk. About 1 mile south of Ashton in Makerfield. PENNINGTON FLASH COUNTRY PARK, Off St Helens Road, Leigh, Greater Manchester, WN7 3PA. Tel: 01942 605253. 200 hectare Country Park, centred on a 70 hectare lake. Well maintained paths cater for walkers, cyclists and horse riders. Bird watching hides (with wheelchair access), overlooking the Nature Reserve and it's 230 species of birds. Information Centre. 9 hole golf course. Childrens play area, picnic and recreation areas, fishing. Pay and display parking. About 3 miles east of Ashton in Makerfield. THREE SISTERS RECREATION AREA, Three Sisters Road, Bryn, Ashton-in-Makerfield, WN4 8DD. Tel: 01942 720453. Reclaimed colliery spoil heaps now providing a large recreation area. Motor sports in the Arena run by Aintree Racing Drivers School. (More information below). Coarse fishing. Canoeing. Model boats. Footpaths for walkers, cyclists and horse riders. Toilets and Free Parking. About 1 mile north of Ashton in Makerfield. Three Sisters Race Circuit, Three Sisters Road, Ashton-in-Makerfield, Lancashire, WN4 8DD. Tel: 0800 234 6034. The Racing School is Europe's longest established race school and has been delivering exceptional driving gifts and experiences since 1978. We operate our experiences at Rockingham Motor Speedway in Northamptonshire and Three Sisters Race Circuit in Lancashire. www.racing-school.co.uk. About 1 mile north of Ashton in Makerfield. Wigan Pier, Wallgate, Wigan, WN3 4EU. Tel: 01942 323666. Situated on the banks of the Leeds-Liverpool Canal, Wigan Pier is one of the north wests favourite visitor attractions. At the heart of The Wigan Pier Experience is The Way We Were, an authentic recreation of life in the 1900s for the people of Wigan and surrounding Lancashire. The Trencherfield Mill Steam Engine, considered to be one of the world's marvels of engineering, has now been given a new lease of life, roaring back into action in September 2004. About 4 miles north of Ashton in Makerfield. Oldham Coliseum, Fairbottom Street, Oldham, Lancashire, OL1 3SW. Tel: 0161 624 2829. Oldham Coliseum has seen Eric Sykes, Charlie Chaplin, Dame Thora Hird and Dora Bryan tread its boards. The Coliseum has a reputation as one of Britain s most haunted theatres. www.coliseum.org.uk. About 2 miles north of Ashton under Lyne. Saddleworth Museum & Art Gallery, High Street, Uppermill, Oldham. Tel: 01457 874093. The history of Saddleworth. Our museum displays change regularly and we have two major exhibitions a year. Housed in one of the out buildings of the 19th century Victoria Mill, location beside the Huddersfield Narrow Canal. www.saddleworthmuseum.co.uk. About 5 miles north east of Ashton under Lyne. Portland Basin Museum. Tel: 0161 343 2878. Situated alongside the Ashton Canal at Portland Basin. The Ashton Canal has undergone much improvement in recent years. It winds its way through 18 locks from Manchester to Ashton-under-Lyne. After falling into disrepair it reopened in 1974 and is now a popular circular boating route through city and countryside. Travels through Ashton under Lyne. Setantii and the Museum of the Manchester Regiment - both housed in Ashton under LyneTown Hall. Tel: 0161 343 4343. Setantii - exploring the history of the Tameside area. Museum of the Manchester Regiment - a small museum dedicated to the Manchester Regiment which was associated with the town for many years. Location: In the centre of Ashton under Lyne. Lewis Textile Museum, Exchange Street, Blackburn, BB1 7JN, Lancashire. Tel: 01254 667 130. Opened in 1938. The history of Blackburn's cotton industry. Costume and Textile based exhibitions. A replica of Hargreaves' Spinning Jenny. Location: In the centre of Blackburn. King George's Hall, Northgate, Blackburn, BB2 1AA. Tel: 01254 582579. Shows & concerts change monthly. Different pantomime every Christmas. Pay & display parking. Blakeys Bistro & bar. Blakey's is a popular nightspot, with organised live music events and as a social venue. www.kinggeorgeshall.com. Location: In the centre of Blackburn. Samlesbury Hall, Preston New Rd, Samlesbury, Preston PR5 OUP. Tel: 01254 812010. Samlesbury Hall is a 14th Century Manor House. A trust was founded in the 1920 when the Hall was about to be demolished, since then the Hall has been a museum and Gallery and Host to many Grand functions. The Hall is open to the public every day except Saturdays when we are closed for weddings. www.samlesburyhall.co.uk. About 3 miles west of Blackburn. Hoghton Tower Garden, Hoghton, Preston, Lancashire, PR5 0SH. Tel: 01254-852986. An extensive sixteenth century house with courtyards, outbuildings and walled gardens. Probably one of the most dramatic looking houses in Lancashire. It stands proudly on its hill overlooking the surrounding countryside, an impressive sight for visitors driving up its mile long drive. See website for events and prices. www.hoghtontower.co.uk. About 3 miles west of Blackburn. SOUTH RIBBLE EXHIBITION CENTRE, LEYLAND Tel: 01772 422041.The restored 16th century Grammar School is now a museum reflecting the borough's history and is the venue for a monthly exhibitions programme. The School was one of the earliest in the county and dates from 1524. Much of the present building dates from c.1580 and is a fine example of the local timber framed construction technique. About 8 miles west of Blackburn. The British Commercial vehicle Museum, King Steet, Leyland, Nr Preston PR25 2LE. Tel: 01772 451011. This is one of Britians most important heritage collections - a unique display of historic commercial vehicles and buses spanning a Century of truck and bus building. www.commercialvehiclemuseum.co.uk. About 8 miles west of Blackburn. Pleasure Beach, Blackpool. Tel: 0870 444 5566. Theres plenty to do at Pleasure Beach, with over 125 rides and attractions and 3 spectacular shows. Take a thrilling ride on the Pepsi Max Big One, the Revolution or experience the classic twin tracked coaster the Grand National. Plus your wristband will gain you entry to one of our superb shows. www.blackpoolpleasurebeach.com. Location: In the centre of Blackpool. Blackpool Tower. The tower is 158 m (518 ft 9 in) tall, inspired by the Eiffel Tower in Paris. Its base is hidden by a building housing the Blackpool Tower circus. The top of the tower is accessed by two lifts. There are four viewing platforms open to the public, the enclosed lower platform contains a glass floor above the south-west leg that allows visitors to look down on the street below. www.theblackpooltower.co.uk. Location: In the centre of Blackpool. Blackpool trams. The first tram line in Blackpool opened along the Promenade in 1885, and was the first electric tramway in the country. Blackpool Corporation took over the system in 1892, and the system expanded to serve much of the Fylde coast and towns inland. The line is now the only remaining 'traditional' tramway in UK. The line is a mix of street running and reserved track. Along the Promenade trams run next to the road, then after a short section of street-running the line runs on reserved track for the interurban section to Fleetwood. www.thetrams.co.uk. Location: In the centre of Blackpool. Smithills Hall and Estate, Smithills Dean Road, Bolton BL1 7NP- Tel: 01204 332377. Smithills Hall is one of the earliest and most important examples of a Lancashire manor house. A recent £1.8 million renovation scheme has restored additional rooms to their full splendour. The house mirrors the changes in fashion and living conditions from the late 14th to the late 19th century, having been developed and altered by generations of owners. Ring for opening times. About 1 mile north of Bolton centre. Animal World & Butterfly House, Moss Bank Park, Moss Bank Way, Bolton BL1 6NQ - Tel: 01204 334050. Set within Moss Bank Park, Animal World provides a living environment for a variety of animals and birds, from farm animals to chipmunks and wildfowl to tropical birds. The Butterfly House features free flying butterflies and moths, insects, spiders, reptiles and tropical plants. Admission: free. Location: In the centre of Bolton. Bolton Museum, Art Gallery & Aquarium, Le Mans Crescent, Bolton BL1 1SE - Tel: 01204 332211. Bolton Museum and Art Gallery is one of the largest regional galleries in the North West. It houses collections of fine and decorative art, including examples of British sculpture and contemporary ceramics, egyptology, ethnography and local and natural history. The Aquarium runs a successful breeding programme for endangered species of fish. Location: In the centre of Bolton. Hall i'th' Wood, Green Way, off Crompton Way, Bolton BL1 8UA - Tel: 01204 332370. Hall i'th' Wood (pronounced as "al" "i" "thwud") is an attractive, part-timbered, late medieval merchant's house dating from 1530 to 1648. The Hall is furnished with 17th and 18th century furniture and also includes pictures, ceramics and local history items. It is here that Samuel Crompton invented the spinning mule in 1779. Location: In the centre of Bolton. Reebok Stadium/Museum, Burnden Way, Middlebrook Leisure & Retail Park, Bolton BL6 6JW - Tel: 01204 673670. Take a look behind the scenes at the Reebok Stadium, one of the finest in Europe and the home of Bolton Wanderers. The tour begins at the interactive Museum and Tour Centre where the history of one of the founding members of the Football League is brought to life. The tour includes a visit to the players' dressing and warm-up rooms, the officials' changing rooms, the managers' dug-out and the media interview room. www.bwfc.co.uk. About 3 miles west of Bolton. Liverpool Football Club, Anfield Road, Liverpool, Merseyside - Tel: 0151 263 7744. Liverpool FCs Anfield stadium is an imposing place for visiting teams but soccer fans from around the world are welcome at the clubs spectacular visitor centre. www.liverpoolfc.tv. Location: In the centre of Liverpool. Aintree Racecourse, Ormskirk Road, Aintree, Liverpool, L9 5AS Tel: 0151 522 2929 Entertaining & Hospitality - Hospitality: 0151 522 2911. The Grand National meeting is steeped in history and tradition and combines top quality horseracing with style and fashion throughout the three days. www.aintree.co.uk. Location: On the outskirts, north east of Bootle. Albert Dock, 22 Edward Pavilion, Albert Dock, Liverpool, L3 4AF - Tel: +44 (0)151 708 7334. Albert Dock is situated on Liverpool's famous waterfront adjacent to the Pier Head, a mere stroll from the city centre and all its attractions. Location: In the centre of Liverpool. The Walker, William Brown Street, Liverpool, Merseyside, L3 8EL - Tel: 0151 478 4199. Outstanding works include masterpieces by Rubens, Rembrabt, Poussin, Gainsborourgh and Hogarth. Location: In the centre of Liverpool. Tate Gallery Liverpool, Albert Dock, Liverpool - Tel: 0151 702 7400. The gallery houses the National Collection of 20th century art on 4 floors, with stunning views across the Mersey. Part of the historic Albert Dock, it is housed in a converted warehouse. www.tate.org.uk. Location: In the centre of Liverpool. Museum of Liverpool Life, Tel: 0151 487 4080. Celebrates the unique character of this vibrant city and its contribution to natural life. Location: In the centre of Liverpool. Gawthorpe Hall, Padiham, nr Burnley, Lancashire BB12 8UA Tel: 01282 771004 An Elizabethan house with rich interiors and an important textile collection. National trust charges apply. About 3 miles west of Burnley. The East Lancashire Railway was opened in 1846 to link the Manchester to Bolton line with Radcliffe and was a popular passenger and freight route which served the Irwell Valley from Bury, via Ramsbottom, to Rawtenstall and beyond. 1972 saw the last passengers travel on the Bury to Rawtenstall section, and that would have been the end of an era had the East Lancashire Preservation Society not been committed to restoring the line to its former glory. The line was reopened in 1991. www.east-lancs-rly.co.uk. About 8 miles south of Burnley. Towneley Hall Art Gallery and Museums, Towneley Hall, Towneley Park, Burnley BB11 3RQ - Tel: 01282 424213. Towneley was the home of the Towneley family for over 500 years but in 1901 it was sold to Burnley Corporation. Today, the Museum houses a variety of displays encompassing; Natural History, Egyptology, Local History, Textiles, Decorative Art and Regional Furniture. www.towneleyhall.org.uk. Location: On the outskirts, south of Burnley. Fusiliers Museum Lancashire, Wellington Barracks, Bolton Road, Bury BL8 2PL0 - Tel: 0161 764 2208. The Fusilier Collection in Bury tells the exciting story of one of Lancashires most famous Regiments, tracing the 300 year history from 1688 to 1968. www.fusiliersmuseum-lancashire.org.uk. Location: On the outskirts of Bury. East Lancashire Light Railway, Bolton Street Station, Bolton Street, Bury BL9 0EY - Tel : 0161-764 7790. A trip on the East Lancashire Railway is a journey back in time. The original rail line was opened in 1846 to link the Manchester to Bolton line with Radcliffe, and continued along the Irwell Valley to Rawtenstall. The line is now just over 12 miles long. The railway is open every weekend of the year and holds a number of themed events and galas throughout the year including Diesel, Steam and Thomas Events and also offers Driver Experience Courses. www.east-lancs-rly.co.uk. Location: In the centre of Bury. Smithills Hall and Estate, Smithills Dean Road, Bolton BL1 7NP- Tel: 01204 332377. Smithills Hall is one of the earliest and most important examples of a Lancashire manor house. A recent £1.8 million renovation scheme has restored additional rooms to their full splendour. The house mirrors the changes in fashion and living conditions from the late 14th to the late 19th century, having been developed and altered by generations of owners. Ring for opening times. About 7 miles west of Bury. Animal World & Butterfly House, Moss Bank Park, Moss Bank Way, Bolton BL1 6NQ - Tel: 01204 334050. Set within Moss Bank Park, Animal World provides a living environment for a variety of animals and birds, from farm animals to chipmunks and wildfowl to tropical birds. The Butterfly House features free flying butterflies and moths, insects, spiders, reptiles and tropical plants. Admission: free. About 6 miles west of Bury. Heaton Park, Manchester M25 2SW - Tel: 0161 773 1085. Heaton Park is a huge family park 4 miles north of Manchester city centre. There are acres of space for children to run, you can look around Heaton Hall or you can meet our three Alpacas in the Animal Centre. www.heatonpark.org.uk. About 5 miles south of Bury. Heaton Hall is a magnificent 18th century country house set in the middle of Heaton Park's rolling landscape (see above for details). There has been a house on this site since the late 17th century, but it was inherited by Sir Thomas Egerton in 1756 who commissioned architect James Wyatt to re-model the building. www.heatonpark.org.uk. About 5 miles south of Bury. Carnforth Station. Carnforth Railway Station was opened in 1846 by the Lancaster and Carlisle Railway Company as a roadside "second class" station, and was originally just a single platform. It is now thought that the original Lancaster and Carlisle station building, is the building that in later years became the Carnforth station refreshment room. In 1945 Carnforth station was used as the basis, and location for the David Lean film "Brief Encounter" starring Celia Johnson and Trevor Howard, filming taking place on Carnforth station during February 1945. www.carnforth-station.co.uk. Location: In the centre of Carnforth. Lancaster Maritime Museum, Custom House, St George's Quay, Lancaster LA1 1RB. Tel : 01524 382264. Opened in 1985, the museum occupies the former Custom House of 1764 by Richard Gillow and an adjacent warehouse. It uses sounds, smells, reconstructions and audio-visuals to tell the story of the port of Lancaster, the Lancaster Canal, fishing and the ecology of Morecambe Bay. About 4 miles south of Carnforth. Lancaster Priory & Parish Church dates from the 11th century though there has been a church on this site from 630 A.D. The present building, next to Lancaster Castle, is mainly 15th century. It houses ancient 14th century carved wooden stalls made of English oak which are said to be some of the finest of their kind in Europe. There is an Anglian Runic Cross on display by the South West Door. www.priory.lancs.ac.uk. About 4 miles south of Carnforth. Samlesbury Hall, Preston New Rd, Samlesbury, Preston PR5 OUP. Tel: 01254 812010. Samlesbury Hall is a 14th Century Manor House. A trust was founded in the 1920 when the Hall was about to be demolished, since then the Hall has been a museum and Gallery and Host to many Grand functions. The Hall is open to the public every day except Saturdays when we are closed for weddings. www.samlesburyhall.co.uk. About 8 miles north of Chorley. Hoghton Tower Garden, Hoghton, Preston, Lancashire, PR5 0SH. Tel: 01254-852986. An extensive sixteenth century house with courtyards, outbuildings and walled gardens. Probably one of the most dramatic looking houses in Lancashire. It stands proudly on its hill overlooking the surrounding countryside, an impressive sight for visitors driving up its mile long drive. See website for events and prices. www.hoghtontower.co.uk. About 6 miles north of Chorley. SOUTH RIBBLE EXHIBITION CENTRE, LEYLAND Tel: 01772 422041.The restored 16th century Grammar School is now a museum reflecting the borough's history and is the venue for a monthly exhibitions programme. The School was one of the earliest in the county and dates from 1524. Much of the present building dates from c.1580 and is a fine example of the local timber framed construction technique. About 3 miles north of Chorley. The British Commercial vehicle Museum, King Steet, Leyland, Nr Preston PR25 2LE. Tel: 01772 451011. This is one of Britians most important heritage collections - a unique display of historic commercial vehicles and buses spanning a Century of truck and bus building. www.commercialvehiclemuseum.co.uk. About 3 miles north of Chorley. Wigan Pier, Wallgate, Wigan, WN3 4EU. Tel: 01942 323666. Situated on the banks of the Leeds-Liverpool Canal, Wigan Pier is one of the north wests favourite visitor attractions. At the heart of The Wigan Pier Experience is The Way We Were, an authentic recreation of life in the 1900s for the people of Wigan and surrounding Lancashire. The Trencherfield Mill Steam Engine, considered to be one of the world's marvels of engineering, has now been given a new lease of life, roaring back into action in September 2004. About 8 miles south of Chorley. Reebok Stadium/Museum, Burnden Way, Middlebrook Leisure & Retail Park, Bolton BL6 6JW - Tel: 01204 673670. Take a look behind the scenes at the Reebok Stadium, one of the finest in Europe and the home of Bolton Wanderers. The tour begins at the interactive Museum and Tour Centre where the history of one of the founding members of the Football League is brought to life. The tour includes a visit to the players' dressing and warm-up rooms, the officials' changing rooms, the managers' dug-out and the media interview room. www.bwfc.co.uk. About 7 miles south of Chorley. Gawthorpe Hall, Padiham, nr Burnley, Lancashire BB12 8UA Tel: 01282 771004 An Elizabethan house with rich interiors and an important textile collection. National trust charges apply. About 7 miles south of Clitheroe. Clitheroe Castle, Clitheroe Tel: 01200 24635 - Clitheroe Castle is believed to be the smallest keep in the whole of England. It stands on top of a 35-metre outcrop of limestone and is one of the oldest buildings in Lancashire. In the centre of Clitheroe. Towneley Hall Art Gallery and Museums, Towneley Hall, Towneley Park, Burnley BB11 3RQ - Tel: 01282 424213. Towneley was the home of the Towneley family for over 500 years but in 1901 it was sold to Burnley Corporation. Today, the Museum houses a variety of displays encompassing; Natural History, Egyptology, Local History, Textiles, Decorative Art and Regional Furniture. www.towneleyhall.org.uk. About 10 miles south of Clitheroe. Whalley Abbey, The Sands, Whalley, Clitheroe BB7 9SS - Tel: 01254 828400. Standing on the banks of the River Calder, Whalley Abbey has been a focal point for hospitality since the fourteenth century. It began its history as a community of Cistercian monks. The adjacent medieval church has 3 Celtic Scandinavian crosses in its churchyard dating back to the 9th and 11th centuries. www.whalleyabbey.co.uk. About 4 miles south of Clitheroe. Lewis Textile Museum, Exchange Street, Blackburn, BB1 7JN, Lancashire. Tel: 01254 667 130. Opened in 1938. The history of Blackburn's cotton industry. Costume and Textile based exhibitions. A replica of Hargreaves' Spinning Jenny. About 5 miles north of Darwen. King George's Hall, Northgate, Blackburn, BB2 1AA. Tel: 01254 582579. Shows & concerts change monthly. Different pantomime every Christmas. Pay & display parking. Blakeys Bistro & bar. Blakey's is a popular nightspot, with organised live music events and as a social venue. www.kinggeorgeshall.com. About 5 miles north of Darwen. Samlesbury Hall, Preston New Rd, Samlesbury, Preston PR5 OUP. Tel: 01254 812010. Samlesbury Hall is a 14th Century Manor House. A trust was founded in the 1920 when the Hall was about to be demolished, since then the Hall has been a museum and Gallery and Host to many Grand functions. The Hall is open to the public every day except Saturdays when we are closed for weddings. www.samlesburyhall.co.uk. About 9 miles north of Darwen. Hoghton Tower Garden, Hoghton, Preston, Lancashire, PR5 0SH. Tel: 01254-852986. An extensive sixteenth century house with courtyards, outbuildings and walled gardens. Probably one of the most dramatic looking houses in Lancashire. It stands proudly on its hill overlooking the surrounding countryside, an impressive sight for visitors driving up its mile long drive. See website for events and prices. www.hoghtontower.co.uk. About 6 miles northwest of Darwen. SOUTH RIBBLE EXHIBITION CENTRE, LEYLAND Tel: 01772 422041. The restored 16th century Grammar School is now a museum reflecting the borough's history and is the venue for a monthly exhibitions programme. The School was one of the earliest in the county and dates from 1524. Much of the present building dates from c.1580 and is a fine example of the local timber framed construction technique. About 12 miles west of Darwen. The British Commercial vehicle Museum, King Steet, Leyland, Nr Preston PR25 2LE. Tel: 01772 451011. This is one of Britians most important heritage collections - a unique display of historic commercial vehicles and buses spanning a Century of truck and bus building. www.commercialvehiclemuseum.co.uk. About 12 miles west of Darwen. Quarry Bank Mill and Styal Estate, Styal, Wilmslow, Cheshire SK9 4LA. Tel: 01625 527468. One of Britain's greatest industrial heritage sites, including complete working cotton mill. Live demonstrations in the mill. National Trust. Charges apply. About 6 miles south of Didsbury. Manchester Airport, Manchester, M90 1QX. Tel: +44 (0) 161 489 3000. Concorde G-BOAC, the most famous aircraft in the world, is now on public display in Manchester Airport's Aviation Viewing Park. www.manchesterairport.co.uk. About 5 miles south west of Didsbury. Bramall Hall, Bramhall Park, Bramhall, Stockport SK7 3NX. The house is a superb example of Cheshire "black and white" half-timbering, and one of the largest timber-framed houses in the northwest. The core of the house was built in the 14th century, with later Tuor and Jacobean additions around a central courtyard. www.bramhallweb.co.uk. About 4 miles south of Didsbury. Oldham Coliseum, Fairbottom Street, Oldham, Lancashire, OL1 3SW. Tel: 0161 624 2829. Oldham Coliseum has seen Eric Sykes, Charlie Chaplin, Dame Thora Hird and Dora Bryan tread its boards. The Coliseum has a reputation as one of Britain s most haunted theatres. www.coliseum.org.uk. About 4 miles north of Dukinfield. Saddleworth Museum & Art Gallery, High Street, Uppermill, Oldham. Tel: 01457 874093. The history of Saddleworth. Our museum displays change regularly and we have two major exhibitions a year. Housed in one of the out buildings of the 19th century Victoria Mill, location beside the Huddersfield Narrow Canal. www.saddleworthmuseum.co.uk. About 4 miles north of Dukinfield. Portland Basin Museum. Tel: 0161 343 2878. Situated alongside the Ashton Canal at Portland Basin. The Ashton Canal has undergone much improvement in recent years. It winds its way through 18 locks from Manchester to Ashton-under-Lyne. After falling into disrepair it reopened in 1974 and is now a popular circular boating route through city and countryside. About 2 miles north of Dukinfield. Gallery Oldham, Oldham Cultural Quarter, Greaves Street, Oldham OL1 1AL. Tel: 911 4653. Over 12,000 history items. 2,000 works of art. 1,000 items of decorative art. 80,000 natural history specimens. 1,000 geological specimens. 15,000 photographs. Books, pamphlets, documents. In the past, exhibits have included works by Pablo Picasso and L. S. Lowry. Shop, cafe, restaurants. www.galleryoldham.org.uk. About 4 miles north of Dukinfield. Setantii and the Museum of the Manchester Regiment - both housed in Ashton under LyneTown Hall. Tel: 0161 343 4343. Setantii - exploring the history of the Tameside area. Museum of the Manchester Regiment - a small museum dedicated to the Manchester Regiment which was associated with the town for many years. About 2 miles north of Dukinfield. Freeport Fleetwood, Anchorage Road, Fleetwood, Lancashire FY7 6AE. Tel: 01253 877 377. Freeport Fleetwood is a shopping outlet situated on the Fylde Coast. The attractive environment and tranquil marina setting will make your visit to the Village a unique shopping experience. www.freeport-fleetwood.com. Location: On the outskirts of Fleetwood. Pleasure Beach, Blackpool. Tel: 0870 444 5566. Theres plenty to do at Pleasure Beach, with over 125 rides and attractions and 3 spectacular shows. Take a thrilling ride on the Pepsi Max Big One, the Revolution or experience the classic twin tracked coaster the Grand National. Plus your wristband will gain you entry to one of our superb shows. www.blackpoolpleasurebeach.com. About 7 miles north of Fleetwood. Blackpool Tower. The tower is 158 m (518 ft 9 in) tall, inspired by the Eiffel Tower in Paris. Its base is hidden by a building housing the Blackpool Tower circus. The top of the tower is accessed by two lifts. There are four viewing platforms open to the public, the enclosed lower platform contains a glass floor above the south-west leg that allows visitors to look down on the street below. www.theblackpooltower.co.uk. About 7 miles north of Fleetwood. Blackpool trams. The first tram line in Blackpool opened along the Promenade in 1885, and was the first electric tramway in the country. Blackpool Corporation took over the system in 1892, and the system expanded to serve much of the Fylde coast and towns inland. The line is now the only remaining 'traditional' tramway in UK. The line is a mix of street running and reserved track. Along the Promenade trams run next to the road, then after a short section of street-running the line runs on reserved track for the interurban section to Fleetwood. www.thetrams.co.uk. About 7 miles north of Fleetwood. Discovery Centre, High Street, Garstang PR3 1FU. Tel: 01995 602125. The Discovery Centre is in a superb location to start a variety of longer distance walks in the area, and a fine network of paths links up to the Lancaster Canal, the Forest of Bowland and surrounding countryside and villages. Location: In the centre of Garstang. Pleasure Beach, Blackpool. Tel: 0870 444 5566. Theres plenty to do at Pleasure Beach, with over 125 rides and attractions and 3 spectacular shows. Take a thrilling ride on the Pepsi Max Big One, the Revolution or experience the classic twin tracked coaster the Grand National. Plus your wristband will gain you entry to one of our superb shows. www.blackpoolpleasurebeach.com. About 12 miles west of Garstang. Blackpool Tower. The tower is 158 m (518 ft 9 in) tall, inspired by the Eiffel Tower in Paris. Its base is hidden by a building housing the Blackpool Tower circus. The top of the tower is accessed by two lifts. There are four viewing platforms open to the public, the enclosed lower platform contains a glass floor above the south-west leg that allows visitors to look down on the street below. www.theblackpooltower.co.uk. About 12 miles west of Garstang. Blackpool trams. The first tram line in Blackpool opened along the Promenade in 1885, and was the first electric tramway in the country. Blackpool Corporation took over the system in 1892, and the system expanded to serve much of the Fylde coast and towns inland. The line is now the only remaining 'traditional' tramway in UK. The line is a mix of street running and reserved track. Along the Promenade trams run next to the road, then after a short section of street-running the line runs on reserved track for the interurban section to Fleetwood. www.thetrams.co.uk. About 12 miles west of Garstang. Carnforth Station. Carnforth Railway Station was opened in 1846 by the Lancaster and Carlisle Railway Company as a roadside "second class" station, and was originally just a single platform. It is now thought that the original Lancaster and Carlisle station building, is the building that in later years became the Carnforth station refreshment room. In 1945 Carnforth station was used as the basis, and location for the David Lean film "Brief Encounter" starring Celia Johnson and Trevor Howard, filming taking place on Carnforth station during February 1945. www.carnforth-station.co.uk.About 4 miles north of Lancaster. Lancaster Maritime Museum, Custom House, St George's Quay, Lancaster LA1 1RB. Tel : 01524 382264. Opened in 1985, the museum occupies the former Custom House of 1764 by Richard Gillow and an adjacent warehouse. It uses sounds, smells, reconstructions and audio-visuals to tell the story of the port of Lancaster, the Lancaster Canal, fishing and the ecology of Morecambe Bay. Location: In the centre of Lancaster. Lancaster Priory & Parish Church dates from the 11th century though there has been a church on this site from 630 A.D. The present building, next to Lancaster Castle, is mainly 15th century. It houses ancient 14th century carved wooden stalls made of English oak which are said to be some of the finest of their kind in Europe. There is an Anglian Runic Cross on display by the South West Door. www.priory.lancs.ac.uk. Location: In the centre of Lancaster. Ashton Memorial, Williamson Park, Lancaster, Lancashire LA1 1UX. Tel: 01524 33318. The Ashton Memorial was commissioned by Lord Ashton as a tribute to his late wife. Born in Lancaster, Lord Ashton became a millionaire producing oil cloth and linoleum which was exported from the port all over the world. Location: On the outskirts of Lancaster. Lancaster Castle, Castle Parade, Lancaster LA1 1JY. Tel: 01524 64998. Lancaster Castle occupies a city centre hilltop location on the site of three successive Roman forts. It consists of an extensive group of historic structures, including the 12th century Keep, the 14th century Witches' Tower and the 15th century Gatehouse. It is currently used as both a Court and a Prison. www.lancastercastle.com. Location: In the centre of Lancaster. Samlesbury Hall, Preston New Rd, Samlesbury, Preston PR5 OUP. Tel: 01254 812010. Samlesbury Hall is a 14th Century Manor House. A trust was founded in the 1920 when the Hall was about to be demolished, since then the Hall has been a museum and Gallery and Host to many Grand functions. The Hall is open to the public every day except Saturdays when we are closed for weddings. www.samlesburyhall.co.uk. About 7 miles north east of Leyland. Hoghton Tower Garden, Hoghton, Preston, Lancashire, PR5 0SH. Tel: 01254-852986. An extensive sixteenth century house with courtyards, outbuildings and walled gardens. Probably one of the most dramatic looking houses in Lancashire. It stands proudly on its hill overlooking the surrounding countryside, an impressive sight for visitors driving up its mile long drive. See website for events and prices. www.hoghtontower.co.uk. About 5 miles north east of Leyland. SOUTH RIBBLE EXHIBITION CENTRE, LEYLAND Tel: 01772 422041. The restored 16th century Grammar School is now a museum reflecting the borough's history and is the venue for a monthly exhibitions programme. The School was one of the earliest in the county and dates from 1524. Much of the present building dates from c.1580 and is a fine example of the local timber framed construction technique. Location: On the outskirts of Leyland. The British Commercial vehicle Museum, King Steet, Leyland, Nr Preston PR25 2LE. Tel: 01772 451011. This is one of Britians most important heritage collections - a unique display of historic commercial vehicles and buses spanning a Century of truck and bus building. www.commercialvehiclemuseum.co.uk. Location: In the centre of Leyland. Pleasure Beach, Blackpool. Tel: 0870 444 5566. Theres plenty to do at Pleasure Beach, with over 125 rides and attractions and 3 spectacular shows. Take a thrilling ride on the Pepsi Max Big One, the Revolution or experience the classic twin tracked coaster the Grand National. Plus your wristband will gain you entry to one of our superb shows. www.blackpoolpleasurebeach.com. About 4 miles north of Lytham St Anne's. Blackpool Tower. The tower is 158 m (518 ft 9 in) tall, inspired by the Eiffel Tower in Paris. Its base is hidden by a building housing the Blackpool Tower circus. The top of the tower is accessed by two lifts. There are four viewing platforms open to the public, the enclosed lower platform contains a glass floor above the south-west leg that allows visitors to look down on the street below. www.theblackpooltower.co.uk. About 4 miles north of Lytham St Anne's. Blackpool trams. The first tram line in Blackpool opened along the Promenade in 1885, and was the first electric tramway in the country. Blackpool Corporation took over the system in 1892, and the system expanded to serve much of the Fylde coast and towns inland. The line is now the only remaining 'traditional' tramway in UK. The line is a mix of street running and reserved track. Along the Promenade trams run next to the road, then after a short section of street-running the line runs on reserved track for the interurban section to Fleetwood. www.thetrams.co.uk. About 4 miles north of Lytham St Anne's. The Trafford Centre is a large indoor shopping centre with 280 stores, 38 restaurants, a 20-screen UCI cinema and fantastic leisure facilities all under one stunning roof. The Royal Exchange, St. Ann's Square, Manchester Tel: 0161-833-9833 - This building was once a bustling market for thousands of cotton traders. It is now the Royal Exchange Theatre and also houses a popular café and bar. The Bridgwater Hall, Lower Mosley St, Manchester Tel: 0161-950-0000 - Newly built, award-winning concert hall seating over 2,300 people, this auditorium hosts a number of events ranging from classical orchestral performances, comedy shows to jazz concerts. It is home to the famous Hallé Orchestra and boasts an enormous 5500-pipe organ across the whole of one wall. The Lowry, Pier 8, Salford Quays M5, Manchester Tel: 0161-876 2000. The Lowry art gallery is set in the heart of the regenerated Salford Quays. It is a highly original, distinctive and unusual combination of stainless steel and glass. It has 2 theatres, each with its own unique atmosphere, a Promenade and Galleries. The spectacular Lifting Footbridge across the canal links The Lowry to Trafford Wharfside, Manchester United Football Club and the Imperial War Museum North. Old Trafford, Sir Matt Busby Way, Old Trafford, Manchester M16 0RA Tel: 0161 868 8000 Old Trafford (given the nickname The Theatre of Dreams by Bobby Charlton) is a football stadium that serves as the home of Manchester United. Located in the borough of Trafford in Greater Manchester, it has been United's permanent home since 1910. Currently holding just over 76,000 spectators, Old Trafford is by far the largest club ground in Britain. The football stadium is close to the Old Trafford cricket ground. Manchester Town Hall, 2 Albert Square, Manchester - Tel: 0161-234-5000 Built in 1877 and designed by architect Alfred Waterhouse, this Victorian/Gothic structure houses the city council offices and the tourist information centre. Guided tours reveal the importance of this building throughout Manchester's history with painted murals in the Great Hall depicting prominent historical events. Castlefield Urban Heritage Park, 101 Liverpool Rd, Castlefield, Manchester - Tel: 0161-834-4026 Historic restored canal basin home to award-winning Museums and attractions, Part Roman Fort reconstruction, towpath walks and visitor centre. Carnforth Station. Carnforth Railway Station was opened in 1846 by the Lancaster and Carlisle Railway Company as a roadside "second class" station, and was originally just a single platform. It is now thought that the original Lancaster and Carlisle station building, is the building that in later years became the Carnforth station refreshment room. In 1945 Carnforth station was used as the basis, and location for the David Lean film "Brief Encounter" starring Celia Johnson and Trevor Howard, filming taking place on Carnforth station during February 1945. www.carnforth-station.co.uk. About 4 miles south of Morecambe. Lancaster Maritime Museum, Custom House, St George's Quay, Lancaster LA1 1RB. Tel : 01524 382264. Opened in 1985, the museum occupies the former Custom House of 1764 by Richard Gillow and an adjacent warehouse. It uses sounds, smells, reconstructions and audio-visuals to tell the story of the port of Lancaster, the Lancaster Canal, fishing and the ecology of Morecambe Bay. About 3 miles east of Morecambe. Lancaster Priory & Parish Church dates from the 11th century though there has been a church on this site from 630 A.D. The present building, next to Lancaster Castle, is mainly 15th century. It houses ancient 14th century carved wooden stalls made of English oak which are said to be some of the finest of their kind in Europe. There is an Anglian Runic Cross on display by the South West Door. www.priory.lancs.ac.uk. About 3 miles east of Morecambe. Ashton Memorial, Williamson Park, Lancaster, Lancashire LA1 1UX. Tel: 01524 33318. The Ashton Memorial was commissioned by Lord Ashton as a tribute to his late wife. Born in Lancaster, Lord Ashton became a millionaire producing oil cloth and linoleum which was exported from the port all over the world. About 4 miles east of Morecambe. Lancaster Castle, Castle Parade, Lancaster LA1 1JY. Tel: 01524 64998. Lancaster Castle occupies a city centre hilltop location on the site of three successive Roman forts. It consists of an extensive group of historic structures, including the 12th century Keep, the 14th century Witches' Tower and the 15th century Gatehouse. It is currently used as both a Court and a Prison. www.lancastercastle.com. About 3 miles east of Morecambe. Haydock Park Racecourse, Newton-Le-Willows WA12 0HQ. Tel: 01942 402624. Haydock Park is the North West's premier dual purpose racecourse located half way between Liverpool and Manchester, just off junction 23 of the M6 motorway. With around 30 events a year, we offer an excellent choice of top-class fixtures over the jumps and flat. www.haydock-park.co.uk. About 2 miles north of Newton-le-Willows. PENNINGTON FLASH COUNTRY PARK, Off St Helens Road, Leigh, Greater Manchester, WN7 3PA. Tel: 01942 605253. 200 hectare Country Park, centred on a 70 hectare lake. Well maintained paths cater for walkers, cyclists and horse riders. Bird watching hides (with wheelchair access), overlooking the Nature Reserve and it's 230 species of birds. Information Centre. 9 hole golf course. Childrens play area, picnic and recreation areas, fishing. Pay and display parking. About 5 miles north east of Newton-le-Willows. THREE SISTERS RECREATION AREA, Three Sisters Road, Bryn, Ashton-in-Makerfield, WN4 8DD. Tel: 01942 720453. Reclaimed colliery spoil heaps now providing a large recreation area. Motor sports in the Arena run by Aintree Racing Drivers School. (More information below). Coarse fishing. Canoeing. Model boats. Footpaths for walkers, cyclists and horse riders. Toilets and Free Parking. About 5 miles north of Newton-le-Willows. Three Sisters Race Circuit, Three Sisters Road, Ashton-in-Makerfield, Lancashire, WN4 8DD. Tel: 0800 234 6034. The Racing School is Europe's longest established race school and has been delivering exceptional driving gifts and experiences since 1978. We operate our experiences at Rockingham Motor Speedway in Northamptonshire and Three Sisters Race Circuit in Lancashire. www.racing-school.co.uk. About 5 miles north of Newton-le-Willows. Wigan Pier, Wallgate, Wigan, WN3 4EU. Tel: 01942 323666. Situated on the banks of the Leeds-Liverpool Canal, Wigan Pier is one of the north wests favourite visitor attractions. At the heart of The Wigan Pier Experience is The Way We Were, an authentic recreation of life in the 1900s for the people of Wigan and surrounding Lancashire. The Trencherfield Mill Steam Engine, considered to be one of the world's marvels of engineering, has now been given a new lease of life, roaring back into action in September 2004. About 7 miles north of Newton-le-Willows. Warrington Museum and Art Gallery, Bold Street, Warrington WA1 1JG. Tel: 01925 - 442733. The building houses a collection of around 1,000 paintings, (oils, watercolours and prints) from the 19th and early 20th centuries. Also ethnology, egyptology, geology, Roman Britain, pottery/ceramics, botany, fish, amphibians, reptiles, the Civil War, local industries, birds and mammals, and glass. About 4 miles south of Newton-le-Willows. Gulliver's World, Old Hall, Warrington WA5 9YZ. Tel: 01925 444888. Gullivers Warrington is nestled within a beautiful park setting, where much of the fantasy is created by wonderful towering trees, and a beautiful lake forms the centrepiece of the park. From the tumbling and juggling fun of Circus World, mosey on down to High Noon in Western World, walk with dinosaurs in the prehistoric Lost World, feel your knees tremble in Counts Castle and shiver your timbers in Smugglers Wharf. www.gulliversfun.co.uk. About 3 miles south of Newton-le-Willows. Oldham Coliseum, Fairbottom Street, Oldham, Lancashire, OL1 3SW. Tel: 0161 624 2829. Oldham Coliseum has seen Eric Sykes, Charlie Chaplin, Dame Thora Hird and Dora Bryan tread its boards. The Coliseum has a reputation as one of Britain s most haunted theatres. www.coliseum.org.uk. Location: In the centre of Oldham. Saddleworth Museum & Art Gallery, High Street, Uppermill, Oldham. Tel: 01457 874093. The history of Saddleworth. Our museum displays change regularly and we have two major exhibitions a year. Housed in one of the out buildings of the 19th century Victoria Mill, location beside the Huddersfield Narrow Canal. www.saddleworthmuseum.co.uk. About 5 miles east of Oldham. Portland Basin Museum. Tel: 0161 343 2878. Situated alongside the Ashton Canal at Portland Basin. The Ashton Canal has undergone much improvement in recent years. It winds its way through 18 locks from Manchester to Ashton-under-Lyne. After falling into disrepair it reopened in 1974 and is now a popular circular boating route through city and countryside. Location: About 5 miles south of Oldham. Gallery Oldham, Oldham Cultural Quarter, Greaves Street, Oldham OL1 1AL. Tel: 911 4653. Over 12,000 history items. 2,000 works of art. 1,000 items of decorative art. 80,000 natural history specimens. 1,000 geological specimens. 15,000 photographs. Books, pamphlets, documents. In the past, exhibits have included works by Pablo Picasso and L. S. Lowry. Shop, cafe, restaurants. www.galleryoldham.org.uk. Location: In the centre of Oldham. Martin Mere Wildfowl & Wetlands Trust, Burscough, Ormskirk. Tel: 01704 89518. The Wildfowl & Wetlands Trust is the largest international wetland conservation charity in the UK. Have a fantastic day out at Martin Mere seeing, feeding and learning about wetland birds. Licensed cafeteria, children's play area, shops. Excellent disabled access and toilet facilities. Talks and tactile exhibits by prior arrangement. Guide Dogs allowed. About 4 miles north of Ormskirk. Rufford Old Hall, 200 Liverpool Road, Rufford, nr Ormskirk L40 1SG. Tel: 01704 821254. One of Lancashire's finest 16th-century buildings with a spectacular Great Hall, intricately carved wooden screen and hammer-beam roof. NT charges apply. About 5 miles north of Ormskirk. TAWD VALLEY PARK, SKELMERSDALE. Following the course of the River Tawd, this picturesque valley of open grassland and established woodland runs through the heart of Skelmersdale. Three self guided trails help you to enjoy different aspects of the Park. About 5 miles east of Ormskirk. Pleasure Beach, Blackpool. Tel: 0870 444 5566. Theres plenty to do at Pleasure Beach, with over 125 rides and attractions and 3 spectacular shows. Take a thrilling ride on the Pepsi Max Big One, the Revolution or experience the classic twin tracked coaster the Grand National. Plus your wristband will gain you entry to one of our superb shows. www.blackpoolpleasurebeach.com. About 3 miles west of Poulton-Le-Fylde. Blackpool Tower. The tower is 158 m (518 ft 9 in) tall, inspired by the Eiffel Tower in Paris. Its base is hidden by a building housing the Blackpool Tower circus. The top of the tower is accessed by two lifts. There are four viewing platforms open to the public, the enclosed lower platform contains a glass floor above the south-west leg that allows visitors to look down on the street below. www.theblackpooltower.co.uk. About 3 miles west of Poulton-Le-Fylde. Blackpool trams. The first tram line in Blackpool opened along the Promenade in 1885, and was the first electric tramway in the country. Blackpool Corporation took over the system in 1892, and the system expanded to serve much of the Fylde coast and towns inland. The line is now the only remaining 'traditional' tramway in UK. The line is a mix of street running and reserved track. Along the Promenade trams run next to the road, then after a short section of street-running the line runs on reserved track for the interurban section to Fleetwood. www.thetrams.co.uk. About 3 miles west of Poulton-Le-Fylde. Hoghton Tower, Hoghton, Nr. Preston PR5 0SH. Tel: 01254 852 986. A beautiful example of English renaissance architecture standing proudly on a hill overlooking the surrounding countryside. Over the centuries this ancient fortified manor house welcomed and entertained many distinguished guests and visitors including King James I, William III, George V and Queen Mary and the Duke of Edinburgh. www.hoghtontower.co.uk. About 3 miles southeast of Preston. Samlesbury Hall, Preston New Rd, Samlesbury, Preston PR5 OUP. Tel: 01254 812010. Samlesbury Hall is a 14th Century Manor House. It is maintaind by a trust founded in the 1920's when the Hall was about to be demolished, since then the Hall has been a museum and Gallery and Host to many Grand functions. The Hall is open to the public every day except Saturdays when we are closed for weddings, opening times are 11am - 4.30pm at an admission price of £3 for Adults and £1 for children. Henry VIII is here every Sunday giving free guided tours, first tour starts around 11.15am. www.samlesburyhall.co.uk. About 4 miles east of Preston. The Museum of Lancashire, Stanley Street, Preston PR1 4YP. Tel: 01772 534075. Situated within a Grade ll listed building. Discover our Victorian schoolroom, enjoy a tour through the Home Front during World War 2 and Fast Forward to the Fifties. Location: In the centre of Preston. Heaton Park, Manchester M25 2SW - Tel: 0161 773 1085. Heaton Park is a huge family park 4 miles north of Manchester city centre. There are acres of space for children to run, you can look around Heaton Hall or you can meet our three Alpacas in the Animal Centre. www.heatonpark.org.uk. Location: On the outskirts of northeast Prestwich. Heaton Hall is a magnificent 18th century country house set in the middle of Heaton Park's rolling landscape (see above for details). There has been a house on this site since the late 17th century, but it was inherited by Sir Thomas Egerton in 1756 who commissioned architect James Wyatt to re-model the building. www.heatonpark.org.uk. Location: On the outskirts of northeast Prestwich. Fusiliers Museum Lancashire, Wellington Barracks, Bolton Road, Bury BL8 2PL0 - Tel: 0161 764 2208. The Fusilier Collection in Bury tells the exciting story of one of Lancashires most famous Regiments, tracing the 300 year history from 1688 to 1968. www.fusiliersmuseum-lancashire.org.uk. About 6 miles north of Prestwich. East Lancashire Light Railway, Bolton Street Station, Bolton Street, Bury BL9 0EY - Tel : 0161-764 7790. A trip on the East Lancashire Railway is a journey back in time. The original rail line was opened in 1846 to link the Manchester to Bolton line with Radcliffe, and continued along the Irwell Valley to Rawtenstall. The line is now just over 12 miles long. The railway is open every weekend of the year and holds a number of themed events and galas throughout the year including Diesel, Steam and Thomas Events and also offers Driver Experience Courses. www.east-lancs-rly.co.uk. About 6 miles north of Prestwich. The Lowry, Pier 8, Salford Quays M5, Manchester Tel: 0161-876 2000. The Lowry art gallery is set in the heart of the regenerated Salford Quays. It is a highly original, distinctive and unusual combination of stainless steel and glass. It has 2 theatres, each with its own unique atmosphere, a Promenade and Galleries. The spectacular Lifting Footbridge across the canal links The Lowry to Trafford Wharfside, Manchester United Football Club and the Imperial War Museum North. About 4 miles south of Prestwich. Old Trafford, Sir Matt Busby Way, Old Trafford, Manchester M16 0RA Tel: 0161 868 8000 Old Trafford (given the nickname The Theatre of Dreams by Bobby Charlton) is a football stadium that serves as the home of Manchester United. Located in the borough of Trafford in Greater Manchester, it has been United's permanent home since 1910. Currently holding just over 76,000 spectators, Old Trafford is by far the largest club ground in Britain. The football stadium is close to the Old Trafford cricket ground. About 6 miles south of Prestwich. Manchester Town Hall, 2 Albert Square, Manchester - Tel: 0161-234-5000 Built in 1877 and designed by architect Alfred Waterhouse, this Victorian/Gothic structure houses the city council offices and the tourist information centre. Guided tours reveal the importance of this building throughout Manchester's history with painted murals in the Great Hall depicting prominent historical events. About 4 miles south of Prestwich. East Lancashire Light Railway, Bolton Street Station, Bolton Street, Bury BL9 0EY - Tel : 0161-764 7790. A trip on the East Lancashire Railway is a journey back in time. The original rail line was opened in 1846 to link the Manchester to Bolton line with Radcliffe, and continued along the Irwell Valley to Rawtenstall. The line is now just over 12 miles long. The railway is open every weekend of the year and holds a number of themed events and galas throughout the year including Diesel, Steam and Thomas Events and also offers Driver Experience Courses. www.east-lancs-rly.co.uk. Location: The line passes through Ramsbottom. Fusiliers Museum Lancashire, Wellington Barracks, Bolton Road, Bury BL8 2PL0 - Tel: 0161 764 2208. The Fusilier Collection in Bury tells the exciting story of one of Lancashires most famous Regiments, tracing the 300 year history from 1688 to 1968. www.fusiliersmuseum-lancashire.org.uk. About 4 miles south of Ramsbottom. HOLLINGWORTH LAKE COUNTRY PARK, Rakewood Road, Littleborough. Tel: Visitor Centre: 01706 373421. Lying at the foot of Blackstone Edge, there are a wide variety of footpaths and trails exploring the surrounding countryside. A regular programme of guided walks, cycle trips and outdoor activities are organised by Rochdale's Countryside Service. There are excellent lakeside restaurants and pubs, craft shops and entertainment. The one-and-a-half mile walk around the lake is an easy and relaxing stroll; call into the bird hide for to view the wide variety of birdlife in the nature reserve and there are picnic and play areas along the route. About 7 miles west of Ramsbottom. HOLLINGWORTH LAKE COUNTRY PARK, Rakewood Road, Littleborough. Tel: Visitor Centre: 01706 373421. Lying at the foot of Blackstone Edge, there are a wide variety of footpaths and trails exploring the surrounding countryside. A regular programme of guided walks, cycle trips and outdoor activities are organised by Rochdale's Countryside Service. There are excellent lakeside restaurants and pubs, craft shops and entertainment. The one-and-a-half mile walk around the lake is an easy and relaxing stroll; call into the bird hide for to view the wide variety of birdlife in the nature reserve and there are picnic and play areas along the route. About 3 miles northeast of Rochdale. East Lancashire Light Railway, Bolton Street Station, Bolton Street, Bury BL9 0EY - Tel : 0161-764 7790. A trip on the East Lancashire Railway is a journey back in time. The original rail line was opened in 1846 to link the Manchester to Bolton line with Radcliffe, and continued along the Irwell Valley to Rawtenstall. The line is now just over 12 miles long. The railway is open every weekend of the year and holds a number of themed events and galas throughout the year including Diesel, Steam and Thomas Events and also offers Driver Experience Courses. www.east-lancs-rly.co.uk. About 7 miles west of Rochdale. Oldham Coliseum, Fairbottom Street, Oldham, Lancashire, OL1 3SW. Tel: 0161 624 2829. Oldham Coliseum has seen Eric Sykes, Charlie Chaplin, Dame Thora Hird and Dora Bryan tread its boards. The Coliseum has a reputation as one of Britain's most haunted theatres. www.coliseum.org.uk. About 7 miles south of Rochdale. Saddleworth Museum & Art Gallery, High Street, Uppermill, Oldham. Tel: 01457 874093. The history of Saddleworth. Our museum displays change regularly and we have two major exhibitions a year. Housed in one of the out buildings of the 19th century Victoria Mill, location beside the Huddersfield Narrow Canal. www.saddleworthmuseum.co.uk. About 7 miles south of Rochdale. Martin Mere Wildfowl & Wetlands Trust, Burscough, Ormskirk. Tel: 01704 89518. The Wildfowl & Wetlands Trust is the largest international wetland conservation charity in the UK. Have a fantastic day out at Martin Mere seeing, feeding and learning about wetland birds. Licensed cafeteria, children's play area, shops. Excellent disabled access and toilet facilities. Talks and tactile exhibits by prior arrangement. Guide Dogs allowed. About 5 miles west of Skelmersdale. Rufford Old Hall, 200 Liverpool Road, Rufford, nr Ormskirk L40 1SG. Tel: 01704 821254. One of Lancashire's finest 16th-century buildings with a spectacular Great Hall, intricately carved wooden screen and hammer-beam roof. NT charges apply. About 8 miles northeast of Skelmersdale. TAWD VALLEY PARK, SKELMERSDALE. Following the course of the River Tawd, this picturesque valley of open grassland and established woodland runs through the heart of Skelmersdale. Three self guided trails help you to enjoy different aspects of the Park. Location: On the outskirts of Skelmersdale. Wigan Pier, Wallgate, Wigan, WN3 4EU. Tel: 01942 323666. Situated on the banks of the Leeds-Liverpool Canal, Wigan Pier is one of the north wests favourite visitor attractions. At the heart of The Wigan Pier Experience is The Way We Were, an authentic recreation of life in the 1900s for the people of Wigan and surrounding Lancashire. The Trencherfield Mill Steam Engine, considered to be one of the world's marvels of engineering, has now been given a new lease of life, roaring back into action in September 2004. About 5 miles east of Skelmersdale. Martin Mere Wildfowl & Wetlands Trust, Burscough, Ormskirk. Tel: 01704 89518. The Wildfowl & Wetlands Trust is the largest international wetland conservation charity in the UK. Have a fantastic day out at Martin Mere seeing, feeding and learning about wetland birds. Licensed cafeteria, children's play area, shops. Excellent disabled access and toilet facilities. Talks and tactile exhibits by prior arrangement. Guide Dogs allowed. About 8 miles southeast of Southport. Rufford Old Hall, 200 Liverpool Road, Rufford, nr Ormskirk L40 1SG. Tel: 01704 821254. One of Lancashire's finest 16th-century buildings with a spectacular Great Hall, intricately carved wooden screen and hammer-beam roof. NT charges apply. About 10 miles east of Southport. Royal Birkdale, Southport. The stunning coastal resort of Southport is host to the finest links courses in England. This is the home of Royal Birkdale, for many golfers, quite simply, the best of all the great golf courses to have staged The Open Championship. www.royalbirkdale.com. Location: On the outskirts of Southport. THREE SISTERS RECREATION AREA, Three Sisters Road, Bryn, Ashton-in-Makerfield, WN4 8DD. Tel: 01942 720453. Reclaimed colliery spoil heaps now providing a large recreation area. Motor sports in the Arena run by Aintree Racing Drivers School. (More information below). Coarse fishing. Canoeing. Model boats. Footpaths for walkers, cyclists and horse riders. Toilets and Free Parking. About 3 miles south of Wigan. Three Sisters Race Circuit, Three Sisters Road, Ashton-in-Makerfield, Lancashire, WN4 8DD. Tel: 0800 234 6034. The Racing School is Europe's longest established race school and has been delivering exceptional driving gifts and experiences since 1978. We operate our experiences at Rockingham Motor Speedway in Northamptonshire and Three Sisters Race Circuit in Lancashire. www.racing-school.co.uk. About 3 miles south of Wigan. TAWD VALLEY PARK, SKELMERSDALE. Following the course of the River Tawd, this picturesque valley of open grassland and established woodland runs through the heart of Skelmersdale. Three self guided trails help you to enjoy different aspects of the Park. About 5 miles west of Wigan. Wigan Pier, Wallgate, Wigan, WN3 4EU. Tel: 01942 323666. Situated on the banks of the Leeds-Liverpool Canal, Wigan Pier is one of the north wests favourite visitor attractions. At the heart of The Wigan Pier Experience is The Way We Were, an authentic recreation of life in the 1900s for the people of Wigan and surrounding Lancashire. The Trencherfield Mill Steam Engine, considered to be one of the world's marvels of engineering, has now been given a new lease of life, roaring back into action in September 2004. Location: In the centre of Wigan. Reebok Stadium/Museum, Burnden Way, Middlebrook Leisure & Retail Park, Bolton BL6 6JW - Tel: 01204 673670. Take a look behind the scenes at the Reebok Stadium, one of the finest in Europe and the home of Bolton Wanderers. The tour begins at the interactive Museum and Tour Centre where the history of one of the founding members of the Football League is brought to life. The tour includes a visit to the players' dressing and warm-up rooms, the officials' changing rooms, the managers' dug-out and the media interview room. www.bwfc.co.uk. About 5 miles northeast of Wigan.